My boys really like trains. Why do they like trains? It must be something hard-wired into kids. Maybe it is only boys, although, if you ever go to a day-out-with-Thomas, you will see that an awful lot of girls seem to enjoy Thomas trains. The video is of my two-year-old playing on the train that sits in downtown Idaho Springs. My boys could spend hours and hours there if their parents could stand it. Anyway, the Connor boy is very cute.... and he can yell really loud. I like M and M's. Especially peanut M and M's. I do not eat them much because my boy suffers from an alleged peanut allergy. It is not good to have peanut products or even products packaged anywhere near peanuts around my son. I also like peanuts themselves. I do not eat a bunch of those around Tyler either. I do sometimes snack at them at work because Rob brings them in with his food deliveries. Probably he brings them because I said they make good snacks. Who is Rob? It does not matter. Rob is trying to convince us to buy really expensive chairs. I could do several Blogs on Rob Harvey. However, I would have no idea where to begin. But this blog is not about Mr. Harvey. I like M and M's, and I also like Eminem. I cannot listen to him at home much because my boys are too young to hear the profane language that comes out of his mouth. The sexist violent homo-phobic content is also bad for children. It is not good for adults either but theoretically I can handle the destructive nature of his songs. "I don't blame ya. I wouldn't let Hailie listen to me neither." I think most people would assume I would not be much of an Eminem fan because of my quiet non-violent nice-guy non-judgemental dare-I-say-Christan personality. Eminem does not have the same kind of personality. But I think Slim Shadey is extremely talented. I do not understand why he associates himself with no-talent rappers like 50 cent or Obie Trice or other D12 idiots. Maybe he does not realize that he is more talented than those jokers. Or maybe he realizes it and just wants to shine in their company. Some of his songs are simply great. His profanity is horrible and some of his songs advocate some immoral things, and probably should be banned. But all of his songs show that he has talent for rapping and I would even call some of his stuff poetic. "Lose Yourself" from 8 mile won an award and completely deserved it. It is a great song about doing what it takes to chase your dreams. It is a timeless theme and the music itself is powerful and fun to hear. I also think the movie 8 mile was a very good movie and Marshall was awesome as the protagonist. That sound track probably includes the best of his serious lyrical work. Mockingbird is also a wonderful song. It is a sweet proclamation of his love for his daughter. "When I'm Gone" is also a poetic masterpiece. It is an insightful self realization of how destructive his Slim Shady persona has been to his family. Ironically it appears to be his "swan song". He kills slim shady as part of the song's narrative. To be honest, I do not necessarily know that he has done anymore songs after he published "When I'm Gone". He has many other great songs, and even those that are not great are very good. I do not think I have heard an Eminem song, especially those where he does not go in with 50 cent or some other "Gansta Rapper" that I do not enjoy on some level. Some are silly and funny. Some are profound. Some are sweet. It is just too bad he cannot figure out how to clean up the language (and other immoral subject). "Will Smith don't have to cuss in his raps to sell records. Well I do so f+@k him and f#$k you too." I think Eminem likes me too. When he refers to a typical white upper middle class suburban kids he uses the name Eric or Erica. I am quite sure he was thinking of me when he made that choice. I made up that last one, but I am sure if I were more famous so that more people would catch the reference, he would have added "Sheppy-do" to his song. Anyway, I am sure no one cares whether or not I like Eminem. I am at a hockey game. 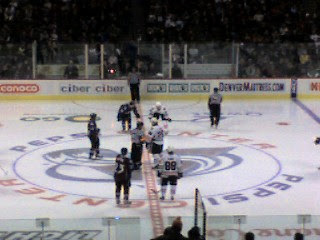 Avs vs. Blackhawks. Of course I am wearing my blackhawks jersey. It is sad I do not really follow the BH anymore so I do not know many of the players. I do follow and know all the av players. But I still find myself cheering for the Hawks. I need to go to more hockey games. This is fun. Here is a page on my website that lists the blogs that I think are my best. None of them are that great, though. Apparently there is another blogger who does not trust the Zizzer Zazzer Zuzz. I am not sure his purpose for writing this blog. It is an exact copy of the second example on http://www.snopes.com/politics/religion/compass.asp except he replaces references to Phillip Pullman, the atheist who wrote the Golden Compass, with Theodor Geisel, better known as Dr. Seuss. Perhaps the author of the blog is trying to point out how easy it is to post something completely ridiculous on the internet. Not only is it easy, but it is not all that difficult to make it sound authentic. I do not know if that is actually what he is doing. Maybe he is just trying to pull me into an intellectual Maelstrom where I spend hours contemplating Dr. Seuss as a poisonous anti-Christian author. This contemplation would certainly make me dizzy. Or maybe, he really thinks Dr. Seuss’s work is meant to contradict Christian themes found in the Narnia books. I sort of doubt it. Actually it seems sort of like something I might do. Why would I do it? My main reason would be that I am a weirdo. Maybe this guy is sort of weird like I am. Trying to read his mind is probably not worth the effort. It would be similar to the intellectual Maelstrom only this is my own creation, and not his intention. Maelstroms are exciting. Did you see the one at the end of At World’s End? It was cool. I have to say, all this controversy on the Golden Compass makes me want to see the movie even more than I did before. I also want to read the books now. Based on what I have heard / read, the worst of the three books is the third where a couple of child heroes go out to try to kill "god". In this case, though, it sounds to me that the "god" they are killing is an entity that claims to have created the universe but did not. It is a false god. I have no problems with an author going out to kill a false god. Kill all the false gods you want. I sort of doubt Jesus would have a problem with getting rid of false gods. The Bible is full of stories of faithful standing up to the false gods established religion. Moses destroyed the golden calf. Jesus himself went crazy in a temple to protest the established religious leaders of the time and how they no longer were actually serving the true God. Anyway, people who go out of their way to point out and become outraged about controversy in works of fiction need to get a life. BTW, just before posting this, I checked back on his blog. I had left a comment telling him I did not get the joke. He responded and It turns out my original thought was pretty correct. He was making a point on how easy it is to post ridiculous claims about any work of fiction. He was also making a point on how ridiculous the whole uproar about the Golden Compass was too. I have to say I completely agree on both points. So remember the Tweedle Beetles? (http://esheppy.blogspot.com/2006/03/tweedle-beetles.html) I bet I have referenced them the most of any person or thing or concept in my blog. I blame them for all kinds of ills with my life and the world in general. Some of my claims in regards to the Tweedle Beetles turned out to be false. For instance, I no longer think that Tweedle Beetles invented the big-screen TV. It was also not their fault that I did not own one. I now do own a big-screen TV and no Beetles of any kind attempted in any way to stop me. Obviously, the Tweedle Beetles did not prevent the Rockies from making the playoffs since the Rockies did end up winning the NLCS. I do not even think that the Tweedle Beetles had anything to do with the pathetic showing the Rockies had in the World Series, although I am quite sure that Tweedle Beetles are big Red Sox fans. They do not like Fox in Socks, but they probably do like Baseball Players in Sox. Anyway, I still do think that they are involved with the Summit County mob. And I still do think they need to be stopped. I am still looking for the Fox in Socks and the Knox in Box to form an alliance whoes sole purpose will be to fight the Tweedle Beetles. Unfortunately, the Fox still has not gotten back to me, and I fear that the Knox has been neutralized by the Tweedle Beetles (or some of their minions) and may even be dead never to be found. I'll bet they put cement overshoes on the poor guy and sent him to the bottom of the ocean. Davy Jones might know where he lies, but DJ will certainly not tell me and even if he did, would it do me any good? I have come close to tracking down the Fox, but nothing concrete enough to share with my faithful readers of this blog (or should I say reader of my blog). In case you wish to refresh your memory about some of the things I have written about the Tweedle Beetles, I have listed some links of Tweedle Beetle Blogs. You might want to go in reverse direction to maintain a chronological order in your mind. A close second to the most referenced person or thing or concept in my blog is probably Jesus. How screwed up am I that Tweedle Beetles seem to hold more interest to me than Jesus? I am pathetic. That is certainly appropriate because Tyler and Connor do interest me more than anything. I reference my wife quite a bit too. Probably more than Tweedle Beetles but less than my kids. I keep saying how uninteresting this blog is, but as I went back through some of these posts, they really were sort of good. (only if I say so myself) I really should go back and read the old posts more often. You should look at some of these too. Anyway, I promise to you that I am not done fighting the Tweedle Beetles and just because I have not chronicled every little battle, does not mean I have not been actively trying to rid the world of the evil known as the Tweedle Beetles. Everyone other than the Tweedle Beetles and their minions, please have a healthy and happy 2008.